Who doesn’t like swords, shields, and casting magical spells! Oh yea.. don’t forget about the blood and gore too! This is often what attracts most of us to this era of gaming. 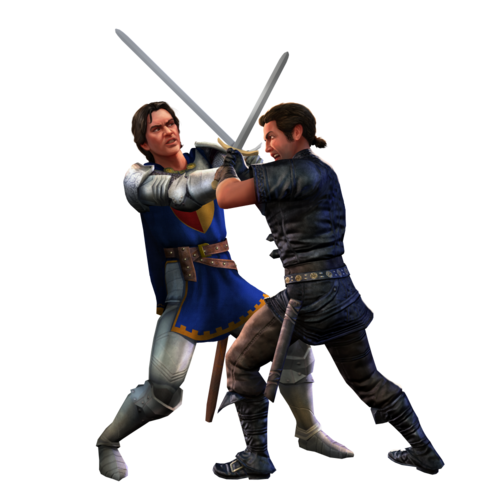 Medieval Games tend to have a great mix of hack and slash with great spell casting and other awesome abilities at the players disposal. There’s honestly so many different types of medieval games, but I’ll stick to some of my favorites and some I think will interest you. So, let’s dive right in! Now this is a great medieval game and was my very first MMORPG. Ultima Online lets you have a lot of freedom within the game and you truly can do anything you want. You define your character by actually using skills in the game. The more you use the skill the higher it levels in points. With a default of 700 points you can choose 7 skills to mold your character. This game was really way ahead of its time and many people still enjoy this game today. However the $14.99/mo subscription has lead a vast majority of its players into the free to play servers this game still holds its own! Most of us know of Skyrim and a lot of us have played it. Skyrim is a great game in many ways with its diverse options and actions available to the player. I think Bethesda, the creators, really dropped the ball when they released Elder Scrolls Online. I played the game on its initial launch and reached level 40 before canceling my subscription. It was honestly a big disappointment. How long before Elder Scrolls Online goes free to play. That’s the real question here and I think a lot of the people who stopped playing would return and give it another shot. Here’s some of the things I think if mixed together correctly would make medieval games perfect. Understand that some of these may not fit into every type of release such as console compared to online PC. 100% Character Development – By this I mean the ability to choose what skills your character gets good at. I’m taking this one from the Ultima Online book. By giving us the ability to skill anything we would like characters become more diverse and it keeps the player more engaged. Also the ability to de-level an ability for example.. let’s say you max out your skill points. You can then choose an ability you want to get rid of and as you start skilling your new one the old one decreases. More Variety – The more options the better. There should be skills for everything. Some examples: cooking, skinning, lumberjack, swordsman, fencing, macing, shields, magic, necromancy, acrobatics, sprinting, tracking, etc.. if there’s something you can do in the game then there should be a skill you can gain to become better at it. No Factions & World PvP – There shouldn’t be factions. Keep everything a large melting pot. The lore of the game can be worked around without having this factions vs that faction content. Land areas should be of two types. One hostile and one non-hostile. This will be perfect for PvP. Also, I would make a lot of the better things in the game only available in PvP areas. Some may disagree with this, but if you don’t want to PvP then you’ll only have to pay more for that item or material. It’ll help to increase the economy of the game. Also, PvP areas should have increased materials for gatherers, miners, etc… higher risk higher rewards. Loot Properties – Instead of having a “epic item” you know that drops from this one boss. Loot should be random and the properties which come on your loot should be somewhat random. Of course we can always have a modifier that will increase our chances of getting bonus loot, but in general all loot should be random. This makes getting a good drop that much more exciting and much more valuable. Mounts – Mounts which have different stats. The ability to train your pets to gain additional stats and make them better. Face it not all horses are the same and the game should reflect this. More Player Interactions & Less NPC – There shouldn’t be NPC’s for everything you need in the game. If you need your armor repaired you should have to seek out a skilled blacksmith that’s an actual player. Create a safe way for them to bring up a report menu and charge a fee at the same time they repair your armor. Talk about making bank with professions! Selling to Players – There should be more ways to sell to a player than an auctioneer & face to face. My recommendation is stores you own in game, booths, etc.. mixed with the auction house. Players for example can use the auction house up to 3 times per day to buy items. After that they must travel to the sellers booth or house where the items are actually for sale to buy it. You won’t be allowed to sell directly on the auction house, but rather must own one of the booths or have a house in which you sell things at. This will let people develop real relationships with sellers. People can become merchants as a profession. Player Housing – There should be limit real estate to increase property value. Housing should be fully customization and actually available to be walked up to in game. This can be seen in games like Arche Age and Ultima Online. If all the land is taken everyone else shouldn’t be left out. Let’s keep the personal bases / hideouts some games have. However these wouldn’t be very customization and would only have limited room and number of people allowed in with you. These are just some of my suggestions for making a truly great medieval game. Let me know what yall think about these in the comments. I really wish there were more medieval games being created that were good. It’s kind of depressing currently looking through the recent releases on Steam and not seeing anything worth playing. Maybe one day soon we’ll have a great release we can all again play and enjoy!